Arm-of-the-Sea on parade. Photo & Copyright by Jim Peppler; 2016. 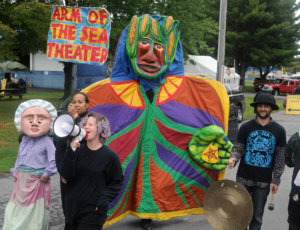 Saugerties July 4th parade – 10am -1pm Saugerties NY – Puppeteers (ages 9 – 90) needed for this hometown parade. THE 2018 ESOPUS CREEK PUPPET SUITE – Performers young and old, stage hands and site crew needed for this annual site-specific outdoor spectacle. Rehearsals: 6-10pm on Aug.13 -16. Performances: 8-9:30pm on Aug.17, 18 & 19. So write to us at art@armofthesea.org and tell us who you are, and how you would like to participate. Participate by first telling us about yourself. Use the form below. Thanks! Please give us some information about what you are interested in. Select what you are interested in.